Well, the next day in Brussels, we again decided to set off for Bruges, and this time we were successful—no drama with the rental flat, and the trains were running on time. So by mid-morning we had arrived in Bruges. Bruges is an interesting little city; it’s the capital of the Belgian province of West-Flanders (and distinctly in the Flemish part of Belgian: put away your French, folks, you won’t be needing it here). It’s also, by deliberate choice, retains a rather substantial medieval feel, between the authentic (Gothic period buildings), semi-authentic (Bruges had a rather substantial Neo-Gothic movement in the 19th century), and modern building codes (intended to keep things looking Gothic), it’s been fairly successful. The result is something halfway between authentic and touristy, but it’s a pleasant destination nonetheless. We did most of the standard Bruges tourist things, including walking along the canals, drinking beer, and climbing the Belfort (Belfry, the central tower in Bruges). After a round of that, we were ready for some lunch. As was, well, the rest of Bruges, including the tourists. But consulting one of several of our tourism guides, a mere block from the central Grote Markt we found Den Amand, a small bistro. It’s a small place, indeed, I think the entire staff was three people (the chef, his wife, and one waiter). 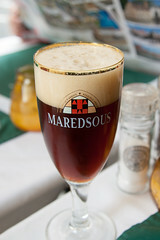 But this place stood out since it distinctly didn’t serve just Belgian cafe fare. The main item here wasn’t steak frites, filet americain, or les moules, it was loempia, aka “fried spring rolls”, with a combination of both Belgian and Asian ingredients. Starting off, we ordered beers (my choice was a particularly nice Maredsous Brun 8), and then the staff brought out a light appetizer of a nice tapenade. As far as the Loempia themselves, these were quite a treat. 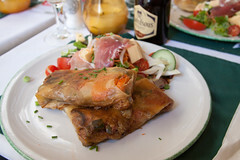 The loempia I ordered were a combination of Asian stir-fried vegetables combined with Belgian cheese and thin-sliced ham. Seeing that I don’t usually experience “Asian” and “Cheese” at the same time, this combination actually worked surprisingly well, with the savory notes of each combining. This was also a nicely-executed fried spring roll, in that the wrapper was light and crispy, and not overly heavy or greasy. Similarly, Dan ordered a set of Loempia with curry filling and basmati rice, and those were a similarly pleasant combination of spicy, savory, and crispy notes. 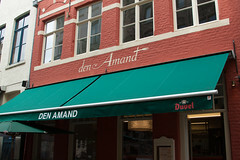 Overall, we enjoyed Den Amand. It was a relatively quiet outpost just off of the main Markt, without the hustle and bustle of the tourist joints. The food was pleasantly different, and the beer list good. I’d certainly give them a repeat visit.